One of the questions I get the most when discussing the Chobe Safaris with interested clients is what the best time of the year is to go on a Chobe Safari. I always say that there isn’t a best time only different times. When we start our CNP Chobe safaris in March every year following the end of the rainy season, the river is very full and this allows us access to areas where we would not be able to get into with the flat bottomed boats a few months later. This is also the time of year when birds such as the African Jacanas and Allan’s Gallinules breed and you get the opportunity to shoot these little miracles soon after they have hatched. In addition to the Jacana photography you also get to possibly photograph the very beautiful and fast flying Pigmy Geese and Lesser Jacanas. There are obviously many other bird species around as well at this time of the year and the mammals begin to come to the river as the water in the veld dries up. We start to see the large Elephant Bulls first, followed by the family units led by the matriarch of the herd. As each day passes so the level of the river drops and with it brings another dynamic to the ecosystem. The lower water levels brings many of the other migratory wading birds just waiting for the lower water levels and the small sandy islands to be exposed where they will build their nests and raise the next generation. One such bird is the threatened African Skimmer who arrives around June each year to look for breeding space. This year the Skimmers have not yet arrived in their numbers as the river is still much higher that last year and the islands are only partially exposed. There are a few pairs about who seem to fly around to all the traditional nesting spots to inspect the water levels and open areas. As the year moves on and the water levels drop further, the numbers of mammals and birds increases as each species tries to ensure access to water and food. When I left Chobe on Monday after 10 days on the River I could see that the river had dropped about 20cm over that period which started to make access to certain areas more and more challenging as the channels started to dry up. We had some really nice Elephant photography with the family units bringing their young to drink and play in the mud and water. The young Elephants are in their element in the water although the river crossings prove a bit too much for some, but with the assistance of mom and friends to support the youngsters during the crossing it becomes easier and less daunting. Elephants love a mud bath and no more so that the youngsters. The youngster below stood up on its hind legs and looked as if it gave its sibling a fat kiss on the forehead. The sibling even supported the youngster’s front legs for it to be albe to get closer. The African Skimmers are duelling in the air for the attentions of the females and the right to mate. This makes for great photography if you can track the fast moving subjects as they chase each other across the water and into the open sky. Of course as the food in the veld becomes scarcer so the mammals are forced to come and look for food in along the River banks as well as in the water where they feed on the grass and lilies. 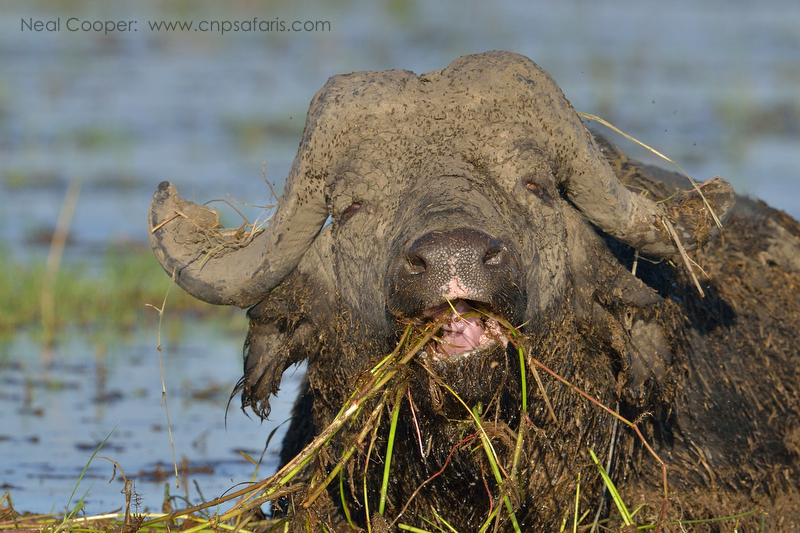 The Cape Buffalo herd along the River is a hundred plus and provides regular meals for the local lion prides. So in conclusion, yes the winter mornings can be a bit cold for a few hours and there after the days are beautiful, the sightings plentiful and the photographic opportunities world class. Join us on a CNP Safari and get to experience the magic of the Chobe first hand.